Did you see that scary video that showed up on YouTube and social media recently? A chap on an Enfield pulls into the top lane to overtake a slowing truck only to discover another truck hurtling towards him in the top lane. The truck is blatantly on the wrong side of the carriageway and not going slowly. The rider escapes injury, though, squeezing between the two trucks in the nick of time. 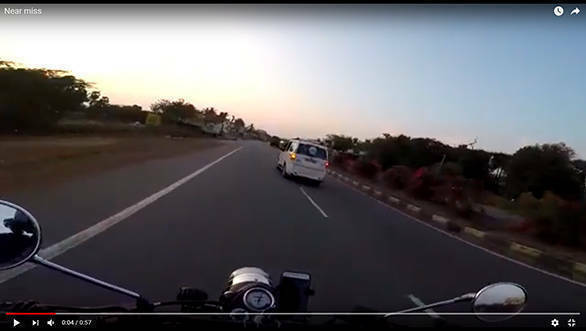 He emerges with nothing more than an almighty scare and nervous laughter from his pillion. Who happens to be without a helmet. I'd roll my eyes if I were a dramatic sort of person. I wrote a detailed breakdown of the episode once I realised that the rider had made two or three crucial errors that led him to that situation. This is not a surprise, riding motorcycles is simultaneously the most thrilling and most demanding thing you can do. It requires you to pay attention. to your skills, to your environment, and you have to stay on top of a scene that's changing constantly. You're at some amount of risk almost all the time. It's intense. I firmly believe that if that intensity isn't for you, then you need to slow to a speed that works for you. Or find other pursuits more suited to your temperament. But someone asked me if events would proceed the same if the chap was in a car instead? I realised that had the rider been wearing a two-tonne metal suit instead of a helmet-mounted action camera, the situation would have evolved rather more differently. A car wouldn't have been able to pull all the way around the slowing taxi in the beginning without considerable effort to start with. And had it remained in the top lane, it would have spotted the truck. Problem solved. 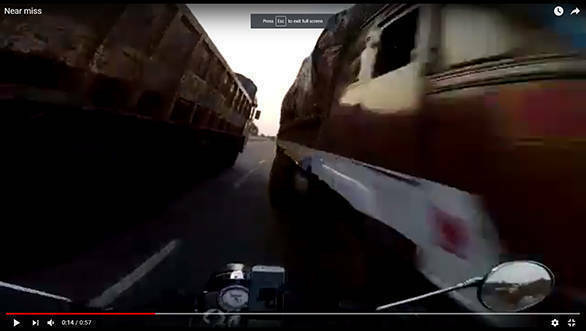 If you assume that it managed the first left-side pass, I suspect that most drivers would be hard on the brakes long before they got as close to the slowing truck as the bike did. There are things like bonnets and stuff to account for. Plus most car drivers operate vastly more defensively than motorcyclists, although that makes no sense given how different the vulnerabilities are. Again, the chances that the car would enter the top lane going too fast look slim to me. But the dramatic change comes when you realise that had a car pulled into the top lane, the oncoming truck would have gone for its brakes. Hard. 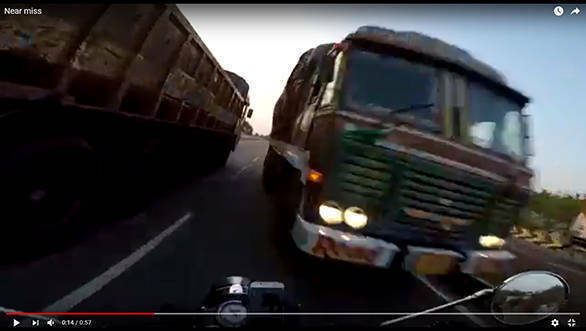 In the video, the oncoming truck has about two seconds to react and you can see that it doesn't. The average human reaction time is said to be a quarter of a second. The truck doesn't change its velocity (speed or direction) at all. 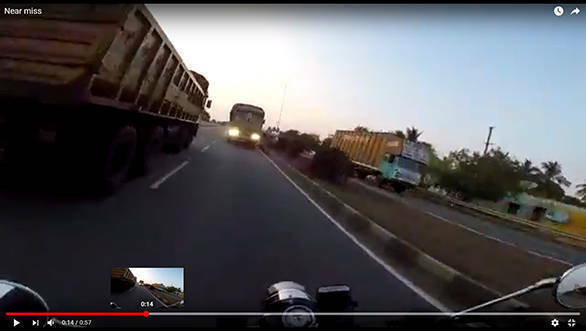 Had the rider not managed to find the gap, the truck would surely have plowed into him. Accident investigators would have found no signs that the truck driver tried to slow at all. Scared yet? This isn't to suggest mal-intent though. It is entirely possible that the truck driver simply froze at the controls. This happens to bike riders also as per many accident studies. Now leave aside the argument that the truck was in the wrong. And that if found, he should be hanged, jailed etc. I am not arguing his innocence - there isn't any. But look at it from the side of us motorcyclists. I've said this before. We're alone. No one is coming. It's scarily true. Each of us that chooses motorcycles as a way of life, accepts that responsibility. Many of you are aware of this, most of you are not. What it means is that when your father gives you the keys, or you take out your first bank loan for a motorcycle, you're doing something altogether more vital and serious than becoming a biker who's about to be the next big thing on InstaSnapBookTwerTube. You've chosen a human-made device that will flood your life with richness, memories, thrills and happiness. But the same device is also an unforgiving mistress. Motorcycles hurt and kill people all the time. They depend on you to determine which of two sides of the coin you're on. That's every single moment of every single ride. It's what makes them so special. Are you prepared?